Companies are often drawn to advertising on Facebook to increase visibility of their brand. That visibility can reflect poorly on a company if it's tied to click farms that employ low-paid workers to "like" company pages. Through the following example, learn more about what click farms are, why they are harmful, and how we can better avoid them. A key takeaway is: Don't let your company risk raking up fake Facebook followers. Know your audience and choose quality over quantity with your paid Facebook ads' demographic reach. By choosing the right demographic and staying away from click farms, you reduce your ads' visibility in risky regions and get a more engagement metric on Facebook. Avoid these common farming locations. Mexico, Brazil, Portugal, Egypt, Nepal, Bangladesh, Philippines and Indonesia. 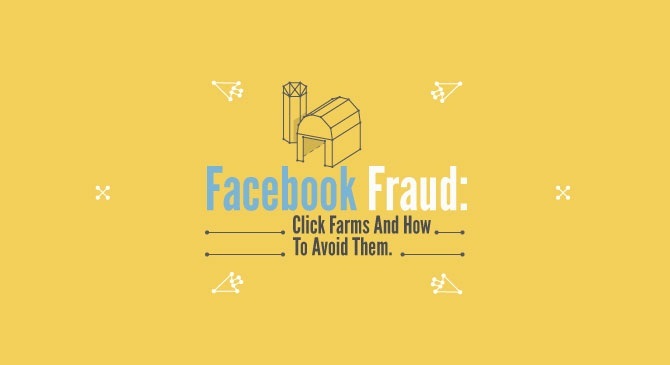 Take a look at this infographic from Verticalmeasures to learn more about how to avoid Facebook Fraud: Click Farms.